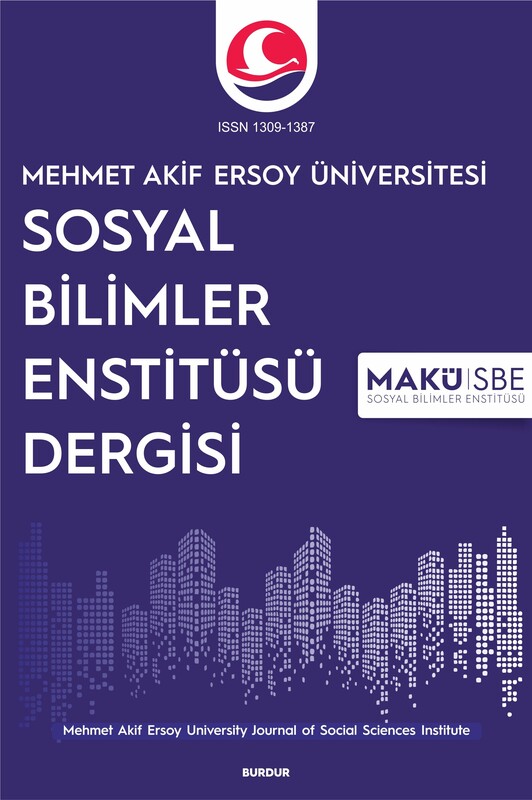 Mehmet Akif Ersoy University Journal of Social Sciences Institute has been published by Mehmet Akif Ersoy University since 2009. It is published online four times a year in March, June, September and December. With a council of advisors consisting of 6 different university faculty members, it is a peer reviewed national journal in the social sciences field. Publishes are accepted in Turkish, English and German. There is no charge for writers who want to publish in the journal. The publication policy of the journal is to include strong, new and original research based on theoretical foundations which will contribute to the field of social sciences. The full responsibility of the manuscripts belongs to the author (s), the manuscripts expressed in the manuscripts are authors' opinions and do not link to the journal. Copyrights of published articles belong to the authors and authors are not paid royalties. Our journal is indexed by ASOS INDEX, OAJI, INDEX COPERNICUS, EBSCO, SCIENTIFIC INDEXING SERVICES and RESEARCHBIB. Mehmet Akif Ersoy University Journal of Social Sciences Institute provides open access to its content immediately by embracing the principle of increasing the global sharing of information on free scientific research. The journal allows the readers to "read, download, copy, distribute, print, search or link to their full texts" in accordance with the Budapest Open Access Initiative (BOAI) definition of "open access". By signing up to the system as an author, you can upload your articles that you want to be evaluated in the next issues of our journal. Articles submitted to our journal must be prepared in accordance with the formal and bibliographic requirements set out in our editorial writing rules. The evaluation process of the articles uploaded to the system takes 4-12 months on average. The referee lists are up to date for each number. Only the names of referees belonging to the articles published in that number are listed. Names of referees who make an evaluation on the rejected article will be placed in the first issue after the decision date. In case of Correction, etc. if the authors do not respond within 15 days, the articles are taken from the publication process and taken to archives.